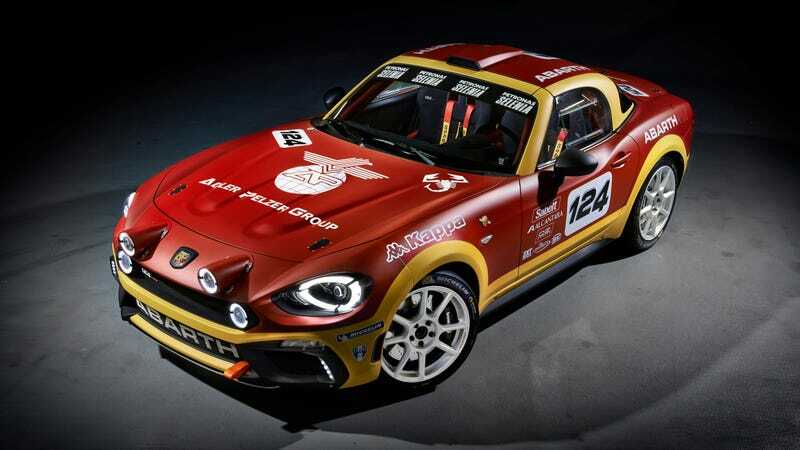 Fiat claims it will race this 300 horsepower, rear-drive Abarth 124 hardtop in 2017. Don’t you dare lie to me, Fiat. This car is too good and my heart is too tender. The car’s stats are pretty lustworthy: it has been stripped and caged, with an interior covered in Alcantara. The car gets four-way adjustable dampers, a six-speed sequential transmission, a limited slip differential, and other rally modifications like those tough OZ wheels. The regular Abarth 124 Spider gets a 1.4-liter turbo four cylinder engine with 160 horsepower. This rally version gets a 1.8 tuned up to 300 horsepower. The car has been built to the FIA’s R-GT class, which allows in rear-drive sports cars to run in competitive rallies, even WRC events. Fiat claims the car will race in the 2017 season. I don’t know if the car will end up being popular like the new R-GT Porsche 911s, or if it will fizzle out like the forgotten Lotus Exige R-GT. Make this happen, Fiat. Don’t break my heart. I’m not strong enough.